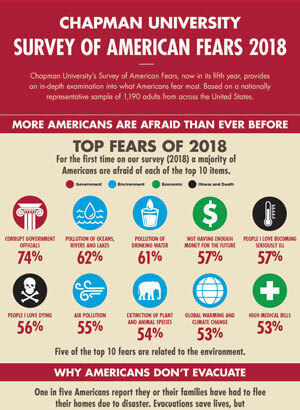 The Chapman University Survey of American Fears Wave 5 (2018) provides an unprecedented look into the fears of average Americans. 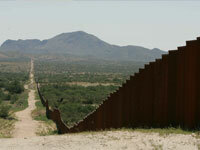 Immigration policy has been a central focus of President Trump’s administration since he announced his candidacy but the majority of Americans do not share his concerns. 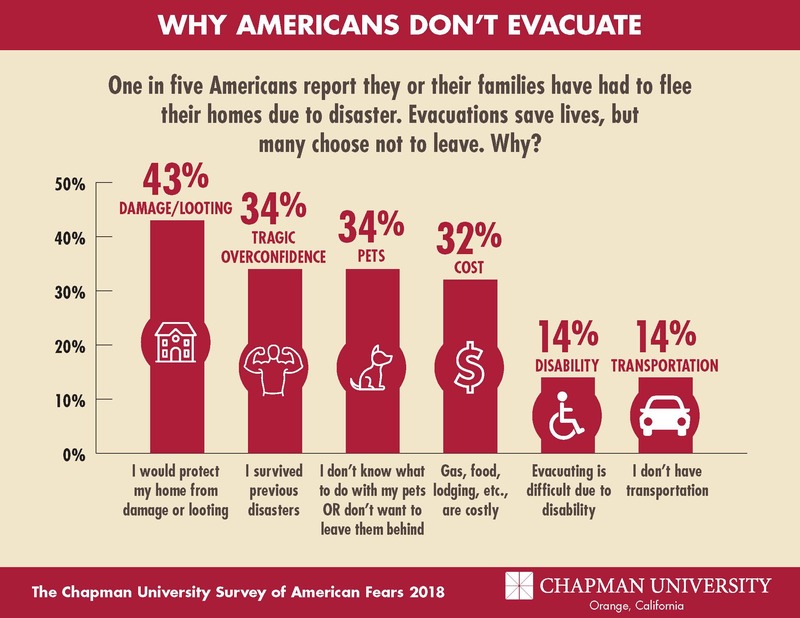 From devastating wildfires to killer hurricanes, nearly a quarter (21%) of America reports they or their families have had to flee their homes due to disaster. 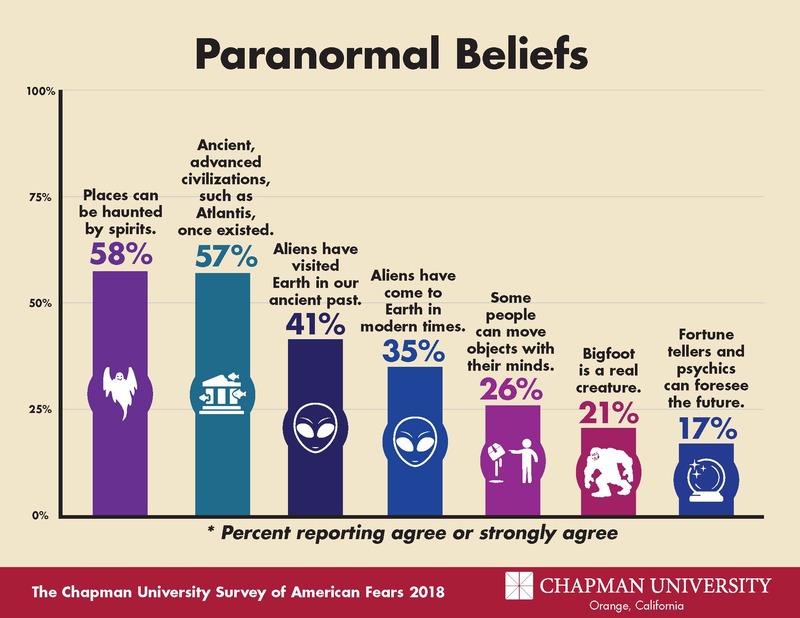 The Chapman University Survey of American Fears Wave 5 (2018) includes a battery of items on paranormal beliefs ranging from belief in aliens to haunted houses. 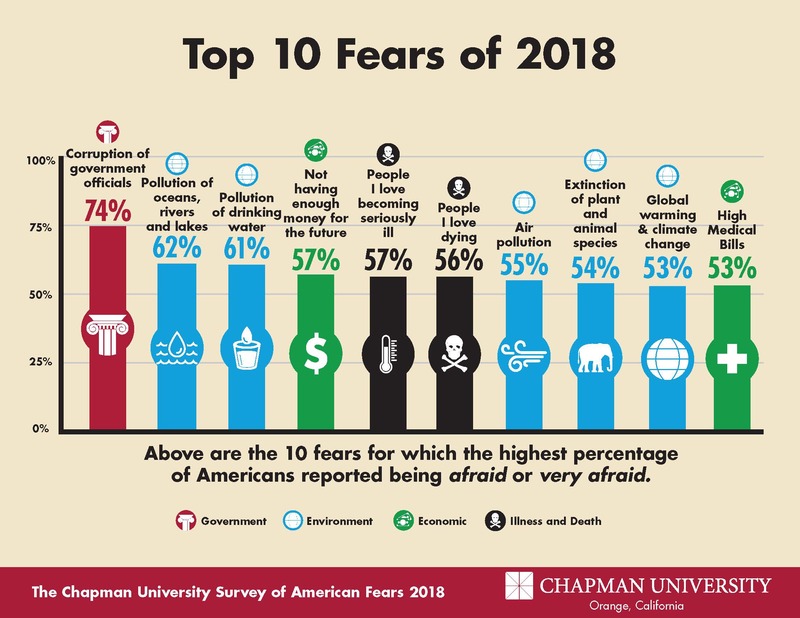 The annual Chapman University Survey of American Fears provides an in-depth examination into the concerns of average Americans, tracking changes and trends over the years. 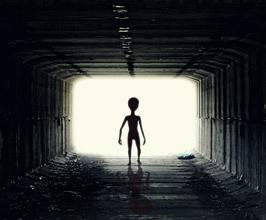 The survey asks about topics ranging from government, health and environmental matters, to disaster preparedness, the paranormal and personal anxieties. 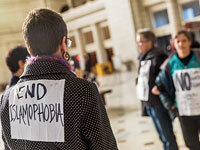 More Americans are afraid than ever, according to the 5th annual Chapman University Survey of American Fears. 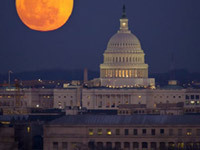 The 2018 survey revealed that government corruption remains Americans’ primary concern, and the state of the environment, which for the first time represents fully half of Americans’ top 10 fears. Learn more through the articles below. The Chapman University Survey of American Fears Wave 5 (2018) provides an unprecedented look into the fears of average Americans. 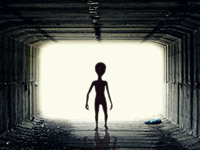 A random sample of 1,190 adults from across the United States were asked their level of fear about different fears across a huge variety of topics ranging from crime, the government, disasters, personal anxieties, technology and many others. 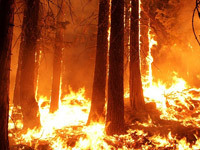 From devastating wildfires to killer hurricanes, nearly a quarter (21%) of America reports they or their families have had to flee their homes due to disaster. 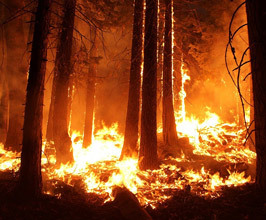 Evacuating one’s home is a heart wrenching choice, but it saves lives. Unfortunately, many Americans choose not to evacuate, even when authorities call for mandatory evacuations. The results are often tragic. Immigration policy has been a central focus of President Trump’s administration. 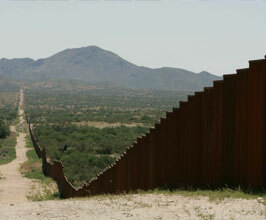 Results from the Chapman University Survey of American Fears show that a majority of Americans do not currently share the President’s concerns over immigration. Roughly 1% of the U.S. adult population are Muslims. 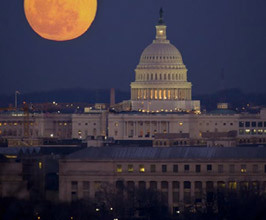 The political and social scrutiny focused on this small group has led to major political figures advocating discriminatory practices based on religion alone. This year, we’ve reexamined many of the same items from our 2016 survey to see if American opinions had changed. They have.